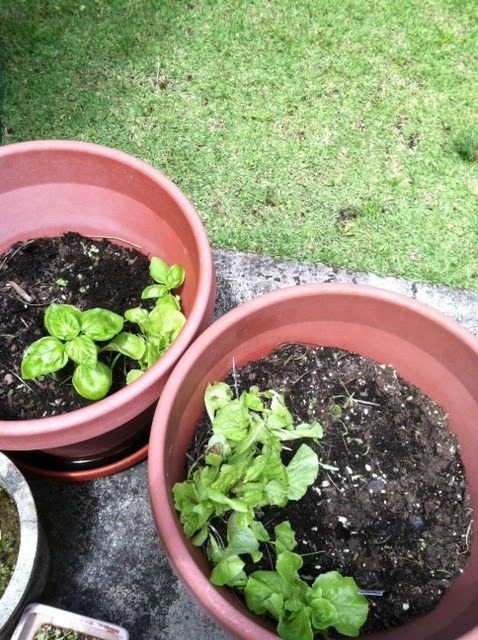 The Helpful Home: Manoa lettuce and Sweet Basil grows again! This isn't a tip...but WTH?!? The girls and I planted some vegetables and herbs a couple years ago, harvested the manoa lettuce, and in a short period of time, killed the sweet basil. Well, I was out in my yard this afternoon weeding (No, this isn't the "WTH" part), and we noticed the manoa lettuce and sweet basil had grown again! No joke! I swear it was just dirt in the planter for two years with no sign of life. It actually looks pretty good and almost ready to harvest. Has anyone ever heard of this? Can roots and seeds remain dormant and sprout/grow two years later? Update 4/16: Posted photo. Lettuce looked much nicer before the twins "weeded" between the lettuce yesterday. Can't see well in photo, but there are three manoa lettuce in right planter and basil and one lettuce in left planter. Update 3/13: I read in several articles that plants and seeds can hibernate and will grow later when soil, weather and other conditions are conducive to growth. I get this...but growth after two years? Wow! Labels: DIY and Crafts, Just because, WTH? ?